George founded the Community Gardens of Tucson in 1990 and was a Tucson resident for over 40 years. As an Extension Agent for Urban Horticulture with the U of A Extension Service, George spent 12 years training Master Gardeners and managing the program until his retirement in 1995. George started CGT with the establishment of 4 community gardens in partnership with homeowners as well as the Community Food Bank. George served as Education Director for CGT for 20 years. His popular books include: “Desert Gardening: Fruits and Vegetables”, “Desert Gardening Calendar”, and “Desert Landscaping”. 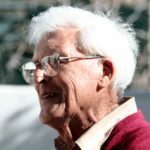 George passed away March 1st, 2018 and all of us at Community Gardens of Tucson, as well as others in the Tucson gardening community, will miss him dearly. He was a gentle man who was patient and understanding, both with plants and with gardeners, from novice to pro. He was always willing to advise why a plant was not doing well and to help improve someone’s gardening skills. He helped make the desert bloom….